An important lesson mentioned in the Kena Upanishad points towards the core teaching of Hinduism – all that is animate and inanimate is nothing but the Supreme Truth (Parabrahma). Once, Devas under the leadership of Indra defeated the demons. Indra, Agni, Vayu, Chandra and all other Devas were intoxicated by the victory and were praising their acts in the battle. Suddenly the Devas felt the presence of a Yaksha outside. Agni was asked to find out about the Yaksha. Yaksa asked Agni who he was. Agni proudly gave his name and boasted that he can burn anything in the universe. Yaksa then pointed towards a dried blade of grass and asked Agni to burn it. 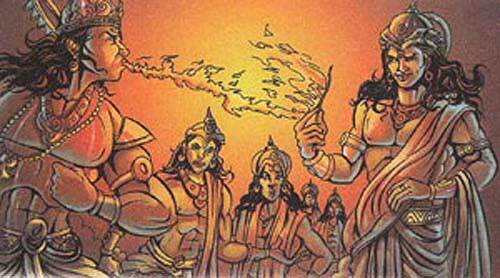 Agni did his best to make the dried blade of grass catch fire, but nothing happened. Frightened, Agni went inside and informed the Devas. Then Vayu was deputed to solve the mystery. He too bragged about his power and said that he can blow away anything in the universe. Yaksha then asked Vayu to blow away the dried blade of grass. Vayu used all his strength but the blade of grass did not move from its place. Vayu failed and returned to other Devas. Indra then decided to meet the Yaksha himself. But he did not find Yaksha. Goddess Parvati who appeared there explained that the Yaksa was Parabrahma – the Supreme One, who had made Indra’s victory possible. Indra and other Devas had forgotten this and were boasting about their strength. Nothing in the universe moves without the will of That. The will of That decides death and birth. Every single atom in the universe derives energy from That. It is ignorance that make us think that I did this, I won, I am powerful etc.